Although it seems like a bit of a chore, learning all the notes on your fretboard is so helpful when it comes to learning to play ukulele. 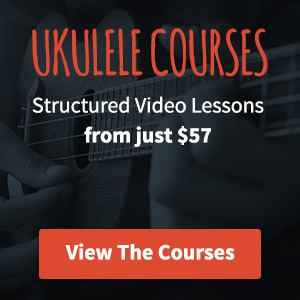 The ability to instantly know what note you’re playing wherever you are on the neck on your uke opens up all kinds of possibilities and should start to connect the dots for you on which notes and chords work together and why. If you would prefer to listen to the audio version of this article, you can press the play button below. By now you should know the names/notes of your open strings, the next step is to get to grips with some of the names of the fretted notes that you play. We only need to know the notes up to the 11th fret, as once we hit the 12th fret we’re a whole octave up and the notes repeat themselves starting from GCEA again. That’s a whopping 44 frets (4 strings x 11 frets) that you need to learn. It’s going to take a little while to get that memorised. I find the best way is to break it up into much smaller chunks, starting with frets 5 and 7. The beauty of frets 5 and 7 is that just like the open strings, they contain no sharps or flats. The notes at the fifth fret are C, F, A and D. At the seventh we have D, G, B and E. Or as I call them, Chickens Fight All Day (CFAD) and Don’t Go Breaking Everything (DGBE). However you remember them doesn’t matter. What matters is that you find a way to make them stick. Ok so we’ve done 8 (plus the 4 open strings which you already know right?) and you’ve got 36 left to go. There’s no quick trick that is going to force the rest into your brain and keep them there. I’d suggest that you work on them in small chunks. Once you have the open strings and frets 5 and 7 memorised. It should be easy enough to add in frets 1, 4, 6 and 8 as you have a reference point for all of them, you already know the notes next to them. It will take time, there’s no getting around that but try and do a little bit each day and before you know it, you’ll be well on the way to becoming a fretboard master. I’ve included another fretboard diagram for you of all the basic notes (not including sharps and flats). SUPER HELPFUL. I love the idea of phrasing to get started. 5th and 7th notes…imagine I never stopped to see the phrase there but now, thanks to the 2 cool ideas, I got ’em. Thanks. Great and thank you…I need to play up the neck more and find this very helpful. Nice phrase for open strings. G. C. E. A. What does it mean when you tune to a low G? A ukulele with a low G isn’t just tuned that way, it uses a specific low G string. That string is still tuned to a G but it’s an octave lower than a high G ukulele. All the chords are still formed the same but when it comes to picking you’ll notice a different sound. Will it have a deeper richer tone? Good morning, just received this email,. Baritone chart or do I need transpose the chart I just received?. I should advise that I am new to the uke, I am a flute player but i love the low sounds of the baritone. I really need to make some resources for Baritone. I think I may put a pack together. Not yet but it is on the list! This is a useful tool, but we dont play by letters we play by notes the pitch of which is notated on a staff. This type of diagram must be accompanied by a staff showing the pitch of notes. For instance in the diagram the question could be asked is the note E at 7th fret the same note as E on second string at the nut. Answer no it sounds an octave higher. Why do most ukulele instructions shy away from musical notation? A sheet of printed music gives all the information you could ever want about a tune. I agree with your comment. A lot of ukulele instructions are geared toward players that have little or no knowledge of reading music. The fastest way to make music on a uke is simplified by using tabs and numbers. I like your posts very much! Helps a lot! Thank you so much! I have always wanted to be intimately familiar with the fret board on my uke, but it seems so overwhelming. The way you show how to begin memorizing the notes and frets make this dream possible! I love your web site! You are a wonderful teacher and I am so happy I found you!